Chrondomalcia patella is the most common cause of knee pain. 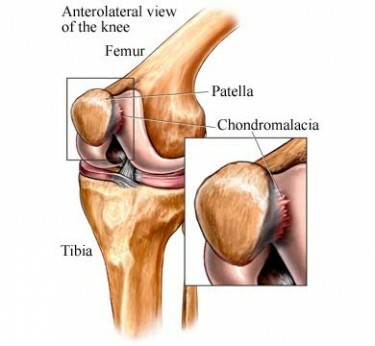 Chondromalcia means "softening of the articular cartilage" and Patella means"knee cap". The articular cartilage is the cartilage lining under the knee cap that articulates (moves) with the knee joint. Under normal circumstances, it is smooth and shiny so that is glides smoothly along the articular groove of the femur as the knee flexes (bends). When it softens, it may break down causing irregularities along the under surface of the patella. It is most common amongst those in the late 30's or early 40's due to the many years of wear and tear. It is also common in active athletes as young as teenagers. The patellar cartilage is one of the earliest places where cartilage breakdown occurs and is slowly progressive, eventually leading to degenerative arthritis (osteoarthritis) of the knee joint. Gradual onset of worsening grinding or pain in the front of the knee (behind the knee cap). Often people experience pain in the knees when standing after being seated for a long period of time. Running and going down (and occasionally up) stairs are also common causes of pain in the condition. As the name implies this is a condition in which the cartilage on the back of the knee cap softens and wears down (fragments) resulting in pain. Essentially it is arthritis of the joint between the knee cap and the thigh bone. Abnormal position of the knee cap since birth or due to trauma. Alta refers to the knee cap being too high. Baja is the term used when the knee cap is too low. The knee cap may also sit at an abnormal angle due to problems such as knock-knees (genu valgum) or bow legs (genu varum). Problems in the feet such as fallen arches (over-pronation) or high arches (over-supination) alter the angles of stress at the knee and can cause similar problems. Muscle imbalances such as a tight iliotibial band (a band of tissue on the outside of the thigh) or weakness of the inner thigh muscles can also contribute to the condition. Any of these situations can result in the knee cap failing to glide (called tracking) properly along the thigh bone as the knee moves. This abnormal gliding wears down the cartilage on the back of the knee cap causing chondromalacia patella. Dr. Pisarek will examine your knees looking for signs of abnormal position and function of the knee cap. He will also assess to determine how the joint feels as it glides past the thigh bone. Often grinding or pain will be experienced during the exam and are significant clues to indicate chondromalacia patella may be the problem. At Advanced Healthcare, Dr. Pisarek has developed a highly effective strategy to achieve rapid results in treating chondromalacia patella. The protocol involves two basic phases... The first phase is designed to alleviate pain rapidly. This involves a combination of various modailties such as low-level laser, chiropractic mobilization techniques, physiotherapy (ie. ultrasound, interferrential current), kinesiology taping and ice to reduce inflammation along with possibly applying a rapid stretch to a specific ligament in the knee which allows the knee cap to glide more freely. The second phase is designed to minimize recurrences of pain and to rehabilitate the condition. This includes: custom computerized orthotics where necessary to stabilize the lower limbs (legs, knees, ankles and feet) including the spine; professional bracing product(s); KT taping protocols; lifestyle modification; and nutritional supplementation to try and assist in rebuilding the cartilage of the knee cap with high quality products to maximize the effect of any possible correction. The prognosis depends on the stage of the condition the first time the condition is identified. Stages I and II are reversible and can be resolved. Once the condition has entered Stage III, symptomatic relief may be obtained but the condition may not be able to be reversed. to effectively treat your chondromalacia patella ... (416) 633-3000.